It’s time to throw out all those mismatched wire and plastic hangers and switch to a more unified look. These hangers are a great choice if you’re buying a new set. They feature a velvety surface so your clothes won’t slip off of them. They’re also super strong and durable, but without being bulky. In fact, they’re so thin, they can increase your closet space by as much as 50 percent. Most customers who have purchased these have been highly satisfied with their performance. Many have said they noticed a difference in space saved when compared to other hangers. Also, a lot of people raved that these don’t cause dents in the shoulders of your blouses or sweaters like some hangers might. Some have had issues with them breaking over time, but the majority of those who have them in their closets would recommend them to others. If you’d like to add temporary shelving to your closet, consider this organizer from Whitmor. It features five open shelves with three side mesh pockets for additional storage or smaller accessories. The built-in metal hook will hang on most standard closet rods and the best part is there is no assembly required. The shelves are perfectly sized to fit folded sweaters, dress shirts, or even jeans. Most customers were happy with the product, with many raving about how sturdy it is (one said they fit five pairs of pants, 20 shirts, a dress, and pajamas, but could probably hold even more). One did mention that if you put too many heavy sweaters or jeans, it will start to sag a bit. But if you’re looking for quality hanging shelves for a reasonable price, this is a great choice. A shoe rack is imperative to have in your closet if you own more than a few pairs and don’t wait them strewn about on the floor. This one from Oceanstar can hold nine to 12 pairs of adult size shoes. The organizer, which is made from carbonized bamboo, has three shelves and can also be used to hold handbags or other accessories. You can clean it by using a damp cloth. It does require a little bit of assembly but the hardware is included. The majority of customers who have purchased this product have been happy with its performance. One said it was easy to put together and that it looks good. The biggest complaint from reviewers is that the first and second shelves are close together, so you can probably only fit sandals or low sneakers. If you’re looking for something to hold a bunch of heels and boots, this might not be the best for you. But if you want something simple and low, it’s a great choice. Need some more help finding what you're looking for? Read through our best shoe storage solutions​ article. A multi-level pant hanger is a great space-saver in your closet, especially if you have many pairs of slacks in there. 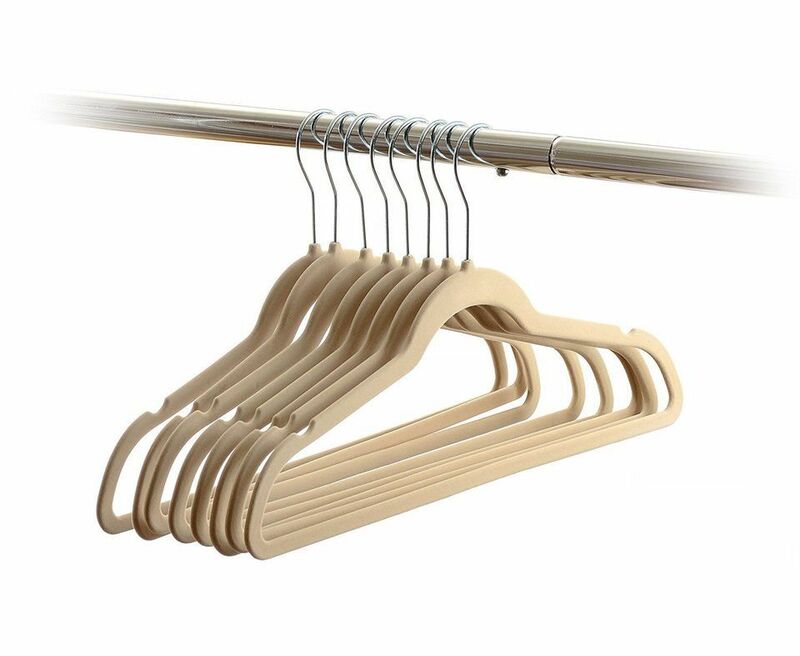 Instead of each one getting their own hanger, you can use one like this to stack them vertically. This particular one from Whitmor can hang up to five pairs of slacks and features a swing arm for easy access to each pair. It’s made of a durable rust-free chrome-plated steel with snag-free vinyl-coated steel bars. Most people who have purchased this product have been satisfied with it. One said it saves space in the closet as well as time ironing because it helps keep slacks wrinkle-free. In terms of critical reviews some have found the arms to be too narrow for larger pant legs, and others have had issues with it breaking. But most would recommend it to others. If you have a lot of accessories or knick-knacks and aren’t sure where to store them, consider investing in an over-the-door organizer like this one. Featuring heavy duty VentilAir breathable fabric, it has 42 double mesh pockets that allow for all sorts of different shaped objects to be stashed inside. You can hang it over the door with the three steel hooks, and it’s also got a tie for the doorknob that helps prevent the organizer from banging against the door when you open your closet. Customers who have bought this have been mostly happy with the quality of the product and how it’s helped keep them organized. Because it doesn’t require installation, you can easily move it to a different door if your storage needs change. Some have had issues with the hooks being too thick for the door to close and the fact that it’s not as wide as they had originally hoped, but most people said they were satisfied with the overall performance of the product and that they would recommend it to others. Let’s face it: closets can get messy. That’s why having storage boxes is a must. They help keep things neat and organized. These particular ones are made of sturdy and durable polyester fabric which can hold up to 25 pounds each. They measure 14.4”x10”x8.3” and can stand up straight even if nothing’s inside. The simple and elegant design makes them a stylish addition to your closet, and the soft braided handles make them easy to get to. So, no matter what you’re storing in there — whether it’s arts and crafts, clothing, or even food — you’ll be able to grab whatever you need easily. Customers have been very happy with the quality of these storage boxes, as the majority of those who have purchased them would recommend it to others with many citing the design and durability as key factors. In fact, most customers gave these five stars in their review. Want to give your closet a full top-to-bottom organization makeover? This deluxe custom kit from Rubbermaid is an excellent option. 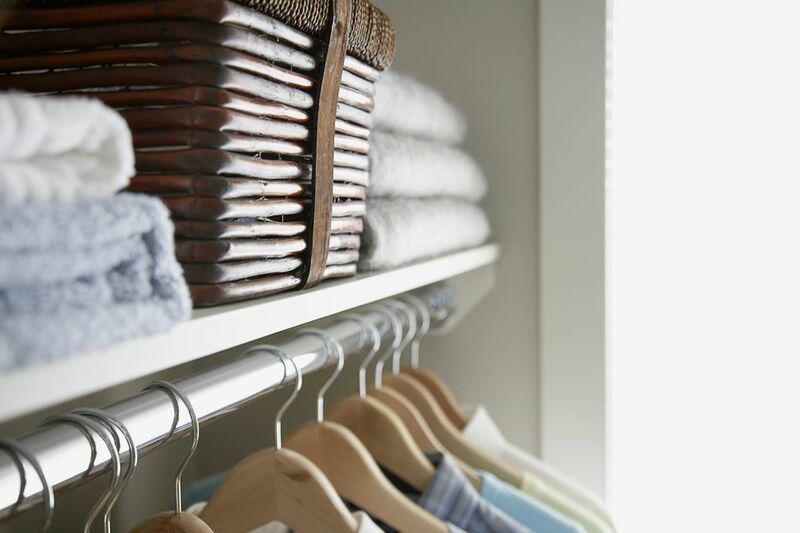 It has everything you need to organize a closet that has at least one wall measuring four to eight feet wide (if your closet is bigger or smaller, there are other sizes of kits available). Featuring four telescoping clothes rods, nine adjustable shelves, and all the hardware you need to complete the installation, the system will give the feel of a completely customized closet design. The majority of customers who rated this system gave it a five-star review, with many saying that it is a great product for the price. A lot of people praised how easy it was to put together and the fact that it added so much space and efficiency to their closet. Some have had issues with the time it takes to install and missing hardware, but most of the people who purchased it love the product and would recommend it to others.